I've been wanting to write this post for weeks, but life and schedules and busyness have gotten in the way. I first saw this on Tamara's blog, but I think it originated here. Why have I been wanting to write it so much? Back then, I posted sporadically and barely "promoted" anything. I blogged purely for my three girls. I had this vision of all my blog posts being bound into a book that they could read when they grew up and became mothers themselves. Everything I wrote was with that vision in mind. Then, about a year ago, I was bitten by the "my blog could make me famous" bug. I dove in head first - posting, promoting, re-designing - anything I could do to get eyes on my blog and get some recognition as a writer. I have gotten some of that recognition and I have also made some wonderful new friends in the blogosphere - a blogging benefit I had never considered, but am very thankful to have stumbled upon. In the midst of all that, though, I forgot my original vision. My writing, while usually about my girls and motherhood, wasn't for them anymore. It was for me. The first topic in the challenge is to list 20 random facts about myself. Twenty is a lot! 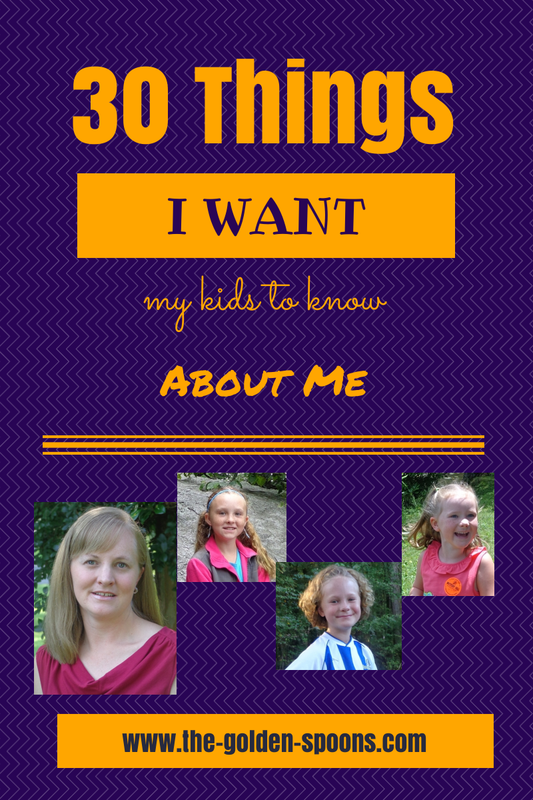 Some of these are things my girls already know about me and others are things they may not realize. They are all the little "quirks" that make me who I am and things I hope they would remember and appreciate knowing about me. 1. My favorite color is purple. Bet you never would have guessed that just by looking at my blog, huh?? :-) I also like green and pink. I'm not a huge fan of pastels or neon shades. 2. I complain about my kids being picky eaters, but, truthfully, I am rather picky myself. I don't like tomatoes, cucumbers, mushrooms, or a slew of other things, most of which are vegetables. I am very hesitant to try anything new that might qualify as "exotic" or "gross." I have never eaten sushi because the idea a raw fish grosses me out. As an adult, I have learned to eat a lot of things that I wouldn't have touched as a kid, but I'm still far from adventurous. 3. I had no morning sickness with my first two pregnancies and only a tiny bit with my third. During my first one, I developed a craving for onions (which I previously disliked). I want them on everything from pizza to sandwiches to salads and I still like them. During my third pregnancy, I developed and aversion to seafood and still have not completely regained my taste for it. 4. With my first two pregnancies, we chose not to find out the gender early. We waited until they were born. With the third, we did find out early. I thought it was a boy because my symptoms were different from the first two which were both girls. I was wrong. 5. I cannot roll my tongue. My hubby and all of my girls can. Apparently this is genetic which is pretty cool because my hubby is adopted. He didn't have genetic ties to anyone (that he knew) until we had our girls. Aside from the fact that they look very much like him, this is one trait they most certainly inherited from him. 8. In high school, I played sports year-round. I played tennis, basketball, and softball. I wasn't a superstar athlete by any means, but I enjoyed it and I miss it now. It used to make me sad that my girls weren't interested in any team sports, but I realize, now, that they are individuals and they have to find their own path. I am, however, thrilled, that my middle one has started playing soccer and my oldest is interested in softball. 10. I wouldn't say I have a fear of heights, but they definitely make me nervous and uncomfortable. I am also rather claustrophobic. 11. In college, I majored in Human Development and Family Studies with a concentration in Birth-Kindergarten Education. (Sounds fancy, huh?) I taught special needs preschoolers in the public school system before I became a stay at home mom. I was a full time stay at home mom for over 11 years before I recently took a temporary, part-time job. I still love kids, but I have no desire to go back to the public school or teaching. 12. I wish I was musically talented. I took piano lessons for years, but it never came easily for me. I wish I could play effortlessly and/or sing beautifully. I am always jealous of those who have the talent. 13. I was voted "Most Dependable" in eighth grade and twelfth grade. Boring, yes, but pretty much sums me up! 14. I always wanted to be a mom, but never envisioned myself with three girls. I always thought I would have two boys and one girl. I have no idea where I got that notion. 15. 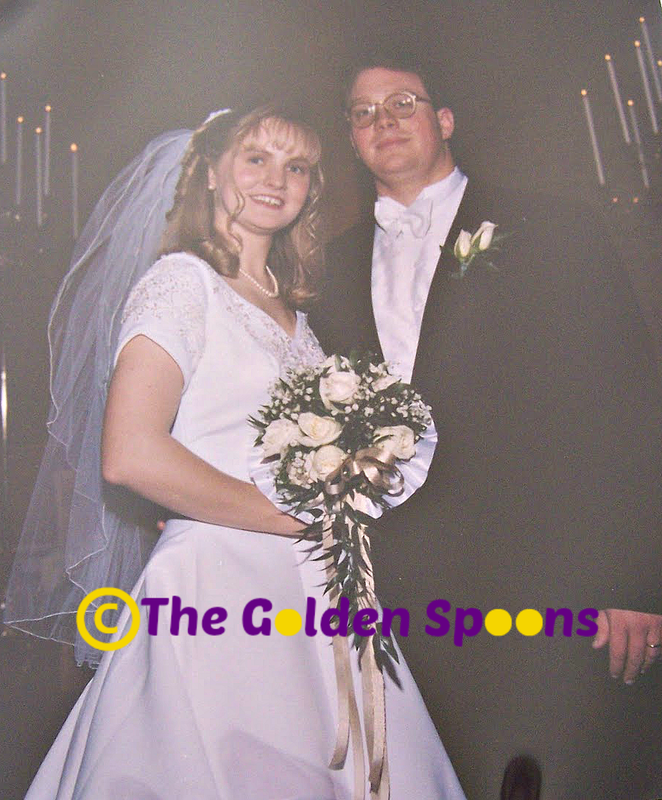 David and I had a very small wedding in the church where I grew up and we had our reception in the fellowship hall with appetizers - no DJ and no alcohol. Today, I think weddings have gotten completely out of hand and I'm glad we didn't spend tons of money on a big party. I still remember my mom telling me that it didn't matter if everything else went wrong, as long as I was there, David was there, and the preacher was there, we would still be just as married. Then, the preacher was late! My dad literally walked across the street in his tux and knocked on his door to get him. He thought it started an hour later. Sorry for the poor quality photo of a photo. I couldn't easily get it out of the album. 17. My love of words and grammar is equal to my disdain for math. I am terrible with numbers. 18. I am also terrible with directions - completely opposite of my husband who seems to have a map and compass engrained into his brain. 19. My favorite animal is a giraffe. I think they are awkwardly graceful and they are physically incapable of making vocal sounds due to the length of their necks, which means they are also very peaceful and quiet. 20. I never drank coffee until after my second child was born and Starbucks became popular. The first coffee I had was a white chocolate mocha and I was hooked. Although, I still take just a bit of coffee with my cream and sugar! Do you want to take the 30 things challenge?? Just click here to see the topics and play along as you are able! Oh, I'm so with you on #17! Hate math, respect words. My mom raised me the same way yours did you and since I write in English which is not my first language, I am TERRIFIED of making a grammatical error! Regardless of who thought of this first, I think that this is such a terrific idea for a post! I'm actually feeling inspired to write one myself! Your wedding reminds me of how weddings used to be. I'm a pastor's kid, and so I went to lots of weddings as a child. The whole family would be invited, and the reception was informal, and all the kids we knew from school would be there. (We lived in a small town, so everybody knew everyone else!) It was so much fun! This is a great idea...I'm doing #30daysoftruth this month, and the AtoZ Challenge in April....so look for this one in May! :) I'll be looking forward to reading all of yours and getting to know you better through them. Glad it inspired you! It was fun to come up with the list. I am always amazed that you are able to write/type so well in English - I often forget that it's not your primary language! Yes! My girls love to watch "Say Yes to the Dress" and shows like that. I enjoy them to, but cannot believe when people spend thousands of dollars on just a dress. I'm such an old fashioned gal, I can't help but think, "You should be spending that money on something like a downpayment on a house. Not a dress you will wear once and that will be out of style in a couple years anyway!" Thanks Teresa! I love to write from a prompt and participating in challenges like these are fun! When I got married (in TX), a lot of weddings were simple Church affairs. The only people I knew who had big huge events were country club members. Then after we got married and I moved to Kansas I realized that everyone had the big she-bang!!! It was the oddest thing to me!! The White Mocha is somewhat my signature drink! And I'm so with you on the exotic foods. Cassidy makes incredible sushi, apparently, and people come from all over to eat it. I've never even tried it! And I've never liked onions, and pregnancy sure didn't jog that for me! I used to hate onions, garlic, zucchini, squash, and a few others, but I actually like them now. I had honestly hoped my feet would grow when I was pregnant because I wear a 5 and they are next to impossible to find. Alas, they did not! Absolutely - it is "the rest" that keeps me from going back, too. I'm so grateful for the wonderful teachers my girls have, but I just don't think I could do it again myself. Well, I can see how a super taster might not like onions! But, I bet it makes the WCM even better! I like a lot more now than I used to. My feet got bigger and wider during pregnancy. I had heard about it happening, but I still think it is the weirdest thing! Very interesting, love reading this, Lisa. I've always had nausea with my pregnancies, though always in the evening, and it would abate by week 13/ 14. I loved this and I learned so much about you from it. At first when I watched the video, I thought... oh yeah, I can do that. Then I got down on the floor and no way I could do that with my feet. My toes are no where near touching the floor! I used to have all sorts of favourite animals until I saw a giraffe at the zoo (we don't have giraffes at our local zoo). I fell in love with their almost gentle (yet as you said it graceful and awkward) beauty. Thanks for sharing. Wishing you a lovely day. Concerts, Conferences, and Canines - Oh my! March Old School Blogging - RaNdoM!! "Honey, You Have to Breathe!"